This topic contains 0 replies, has 1 voice, and was last updated by ketilkn 1 year, 4 months ago. 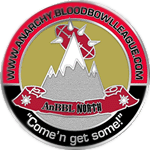 Anarchy Blood Bowl League consist of teams from parts of Norway. Setermoen teams attend the North Conference, while Hamar and Oslo teams attend the South Conference. The league run a sesonal open league and one or more scheduled leagues. Each year Keffo Cup is hosted in Setermoen. In 2017 Keffo Cup was NAF sanctioned for the first time.